"My son holds his stomach tight and cries out loudly in pain. He drains all this energy in crying. Sometimes he exhausts himself so much that he cannot even cry out in pain and just lays motionless in bed. I flinch when he says, 'Naana, the ball in my stomach is hurting me, please remove it'. It is painful to see my little child go through such pain at this tender age," - Venkataraman, Sai Ganesh's father. Sai Ganesh had jaundice when he was born and suffered until he turned 6-month-old, the parents thought it was common for newborns. Over the years, his parents noticed that he wasn't growing like other children and his stomach started bloating while his arms and legs shrank. When parents consulted the local doctors they couldn't identify the problem. A month ago, he got a high fever and was confined to bed with a severe stomach ache. 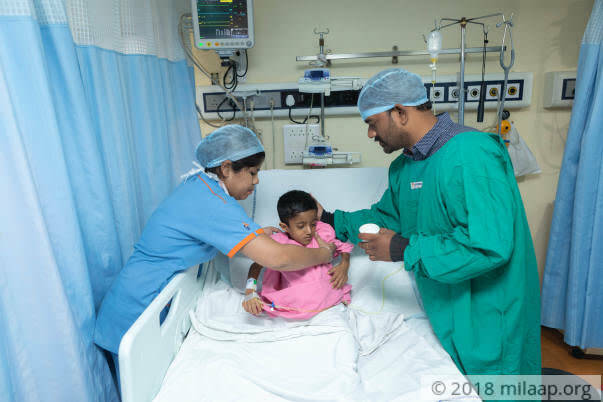 Parents immediately rushed him to a private hospital in Hyderabad where they were told that he is suffering from a severe liver disease. 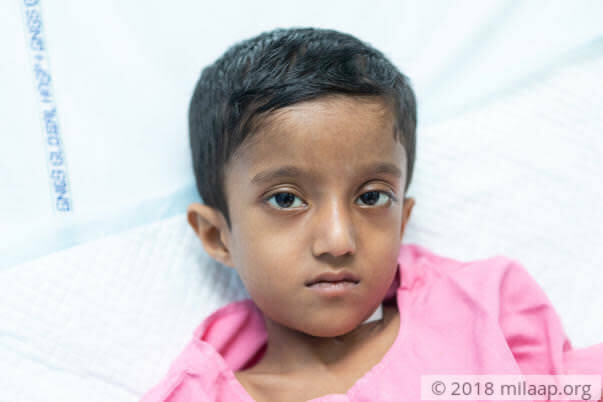 "When they told us that his liver is bloated and needs an immediate surgery we did not know what to do, Before we could gather our strength, he vomited blood. We panicked and immediately admitted him in the ICU. His blood count has drastically dropped and was unable to even move. Even after undergoing blood transfusion continuously for 3 days, he is not even able to lift his hand," - Venkataraman. 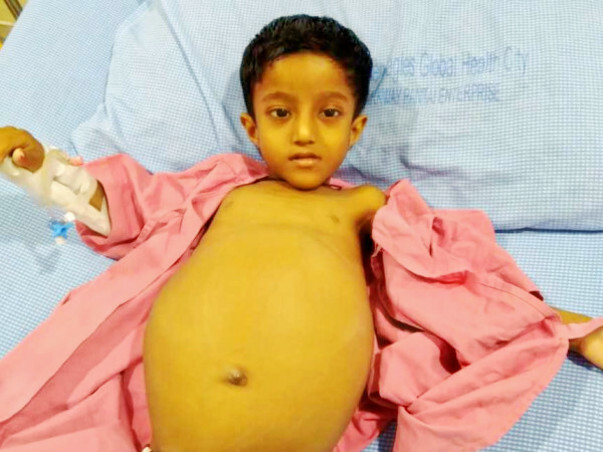 This 5-year-old is suffering from chronic liver disease liver where his liver has enlarged double the size of his stomach and it is bloated abnormally. 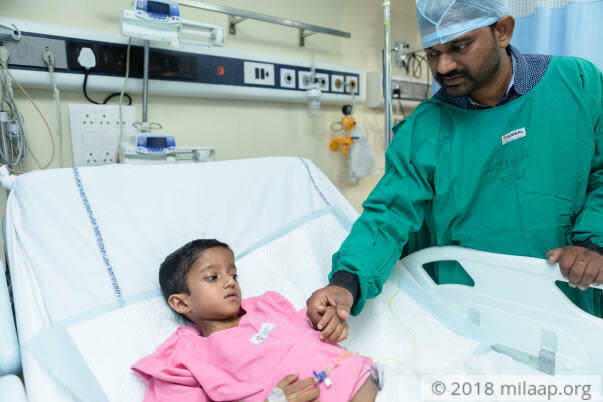 Sai's condition has become critical as his liver stopped functioning normally. He needs to undergo a liver transplant immediately without which he might not be able to live long. "My son used to pray regularly to God that he should look normal as he used to feel inferior to other children of his age. 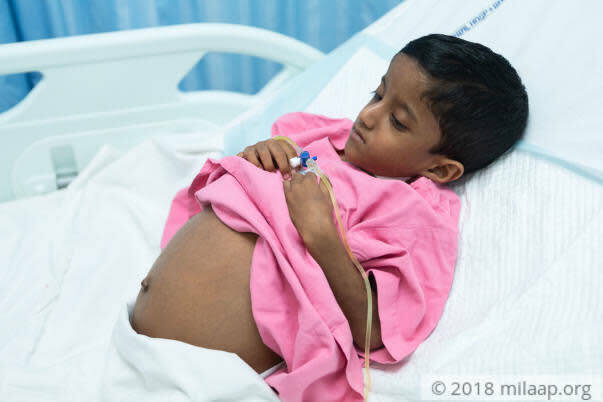 When his mother brought his 3-month-old brother to visit him in the hospital, with the little strength that was left in him he applied vibuthi (hindu holy ash) on his brother's stomach saying 'ball should not grow in his tiny belly'. My wife and I broke down the very moment, it is agonizing to watch him go through this horrible pain,"- Venkataraman. Venkataraman is the sole earner of the family. He works as a clerk in a district court and with his meager income he runs his family. He is unable to bear the burden of the medical expenses and cannot afford the only treatment that can save his son. "I am volunteering to be the donor for my child, but I cannot afford this expensive surgery. I have tried everything I could to save him. With my savings and the amount that I borrowed from my relatives and friends, I was able to spend 2 lakhs until now. 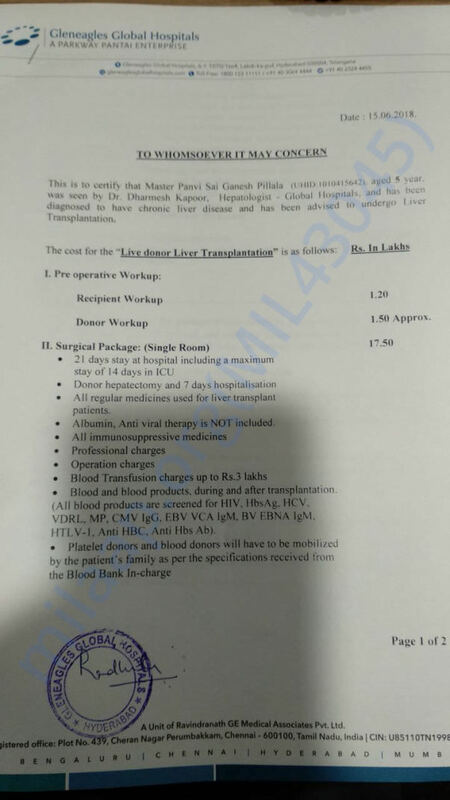 A treatment that can save my son costs 18 lakhs, money I cannot earn even if I work continuously for years. I am left with nothing but hope for the sign of help," - Venkataraman. 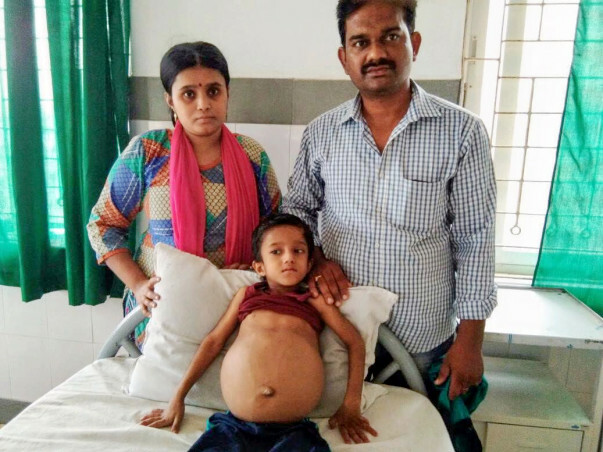 5-year-old Sai Ganesh is fighting for life with a severe liver disorder which has caused bloating in his stomach and growth retardation. He should immediately undergo a liver transplant, without which he may never be able to make it. Your kind donation may help him survive.